The City School was established in Karachi, Pakistan in 1978. Since then, it has grown to become a national and international schools' organization of 152 branches in 43 cities with thousands of students and numerous teaching and non-teaching staff. While its Head Office is in Lahore, its Regional Offices support a network of branches throughout Pakistan and overseas situated in Karachi, Lahore, Islamabad, Hyderabad and Dubai, Jeddah, and Dhakka. The uniform implementation of the curriculum nationally and internationally gives parents, students, and teachers the advantage of transferring from one school to another within the system very efficiently. With its growing presence in new cities within Pakistan and abroad, The City School is continues to expand its reach to meet the demands for quality education. 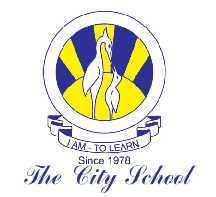 The City School imparts a British-oriented curriculum from the Nursery Level to Cambridge International Examinations Level for sixteen and eighteen years age group and qualifying them for the IGCSE, O-level, and A-level examinations yearly.